This sandwich is a meal all by itself. I really love grilled cheese and I am always looking for ways to change it up. You will need a skillet. You will also need another skillet or griddle for grilling the sandwiches. Heat a skillet to hot. Add the cooking oil. Add the chicken, bell pepper, and onion. Cook, stirring frequently until the chicken is done and the vegetables are tender. Butter one side of all the slices of bread. Heat up your griddle or other skillet. Lay 3 slices of bread butter side down on the griddle. 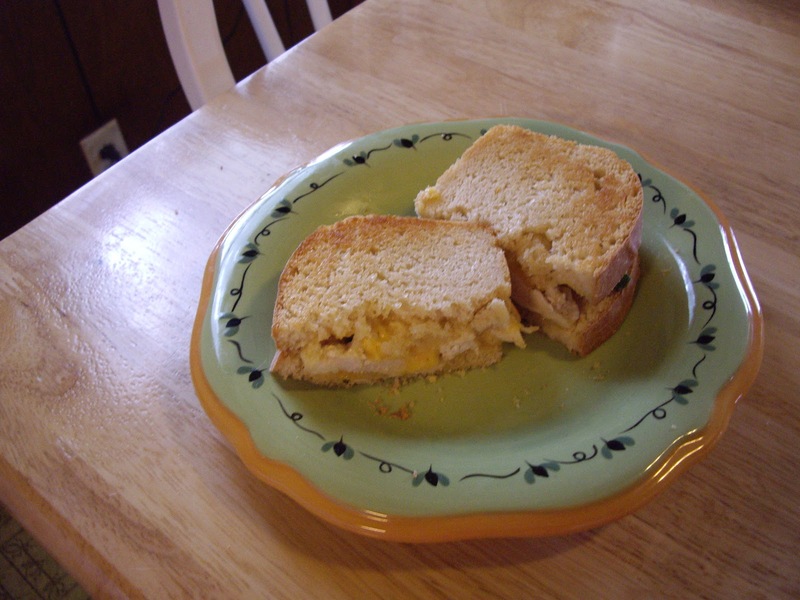 Divide the chicken mixture among the bread slices. Sprinkle with the cheese, about 1/4 cup per sandwich. Lay the remaining slices of bread on top of the chicken- butter side up. Let cook for a few minutes until the bottom bread slice is golden and than carefully flip over. Cook for another few minutes until the cheese is melted. If the chicken breast half is large, you may have enough left to make a 4th sandwich.